VIDEO: Raptors vs. Cavaliers Game 1 Full Highlights - 2016 NBA Eastern Conference Finals - Balita Boss! 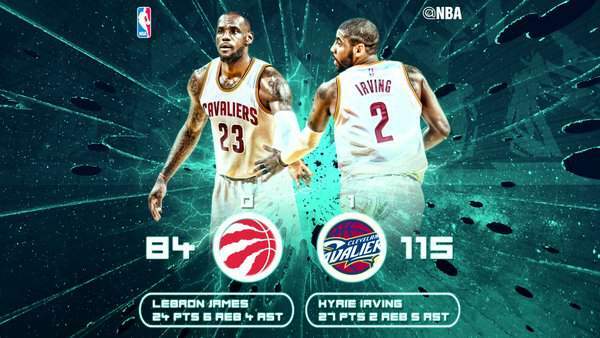 The Cleveland Cavaliers dominated the Toronto Raptors to take Game 1 of the 2016 NBA Eastern Conference Finals with a 115-84 win. Kyrie Irving scored a game-high 27 points, dished five assists and had two steals and two rebounds. LeBron James, the four-time NBA MVP, recorded 24 points in three quarters on 11-of-13 shooting and added six rebounds and four assists. After sweeping Detroit and Atlanta in the first two rounds, the Cavaliers improved to 9-0 in the 2016 playoffs. DeMar DeRozan scored team-high 18 points while Kyle Lowry struggled, finishing with just eight points on 4 of 14 shooting. Bismack Biyombo added 12 for the Raptors. The Cavaliers will have a chance at taking a 2-0 series lead in Game 2 on Thursday in Cleveland (Friday in Philippines).